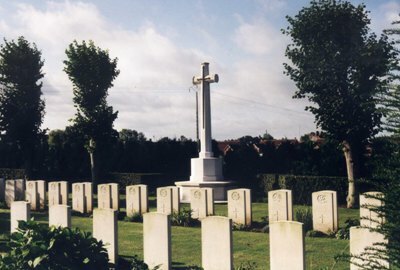 There was heavy fighting in the area of Hondschoote during the retreat to Dunkirk and casualties in the battle were all buried in the communal cemetery. There are over 50, 1939-45 war casualties commemorated in this site. Of these, over a quarter are unidentified and one grave which could not be precisely located, is commemorated by a special memorial inscribed "Buried near this spot".